Chart 1. 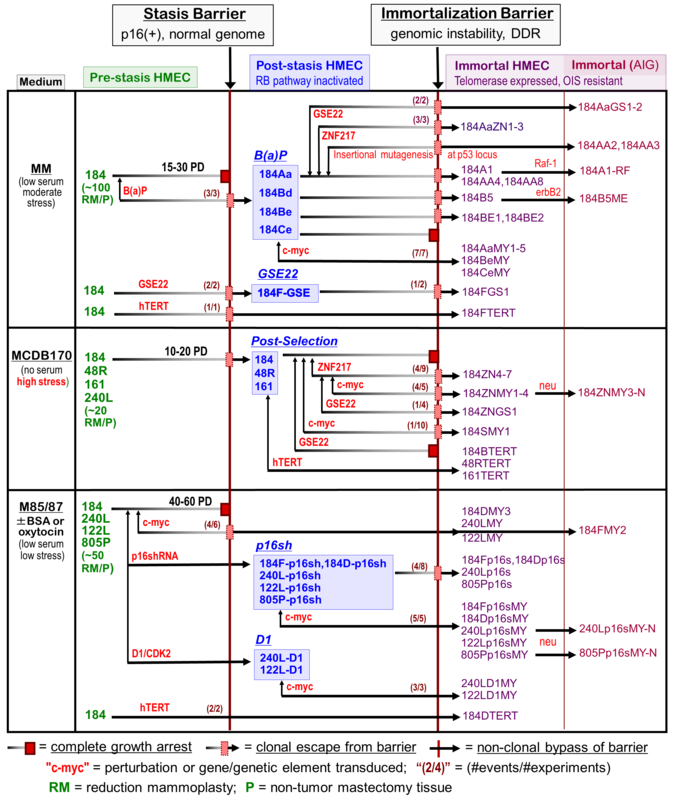 Derivation of finite and immortalized HMEC cultures. Primary cultures derived from reduction mammoplasties (RM), milk (MK) or non-tumor mastectomy tissues (P) were initiated in three different types of medium. Cells grown in any serum-containing medium all ceased proliferation at the stasis barrier. Exposure of pre-stasis cultures to various oncogenic insults (red) induced cells to overcome or bypass stasis and become post-stasis by different means. The middle column shows the different types of post-stasis cultures (e.g., BaP post-stasis had been exposed to the chemical carcinogen benzo(a)pyrene; GSE22 post-stasis had p53 function abrogated by the GSSE22; post-selection post-stasis had been grown in a highly stressful serum-free medium; p16sh post-stasis has been transduced with a vector containing shRNA to p16). Further alterations were required to overcome the telomere dysfunction barrier, gain telomerase expression, and become immortal. For example, following unknown errors presumably resulting from the BaP exposure and the genomic instability at telomere dysfunction, the BaP post-stasis cultures gave rise to rare clonal lines. Transduction with breast cancer-associated oncogenes or GSE22 increased the frequency of immortalization; transduction with c-myc gave uniform immortalization. Cells from post-selection post-stasis cultures all ceased proliferation at the telomere dysfunction barrier. Transduction with breast cancer-associated oncogenes gave rise to rare clonal lines. Pre-stasis HMEC grown in low stress media (bottom row) were non-clonally immortalized by transduction of p16sh followed by c-Myc. Clonal immortalization occurred with c-Myc or p16sh alone. Non-malignant immortal lines were no longer sensitive to OIS, and overexpression a number of different oncogenic genes conferred AIG (anchorage-independent growth). The greatest change in properties occurs when the finite cells become immortal. Non-malignant immortal lines cluster with tumor-derived lines and not the finite cells for many properties (e.g., gene expression, global promoter methylation).